For other uses, see Tocantins (disambiguation). 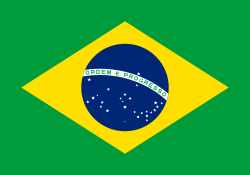 Motto: "Co yvy ore retama"
Tocantins (Portuguese pronunciation: [tokɐ̃ˈtʃĩs]A) is one of the states of Brazil. (From: Tukã´, Toucan + tï, beak. lit. "Toucan's beak" in Tupi language). 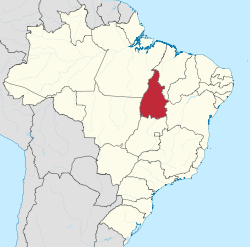 It is the newest of the 26 Brazilian states, formed in 1988 and encompassing what had formerly been the northern two-fifths of the state of Goiás. 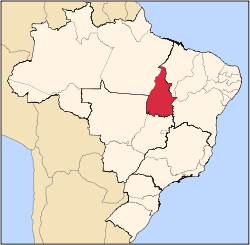 Tocantins covers 277,620.91 square kilometres (107,190.03 sq mi) and has a population of 1,496,880 (2014 est.). Construction of its capital, Palmas, began in 1989; most of the other cities in the state date to the Portuguese colonial period. With the exception of Araguaína there are few other cities with a significant population in the state. The government has invested in a new capital, a major hydropower dam, railroads and related infrastructure to develop this primarily agricultural area. 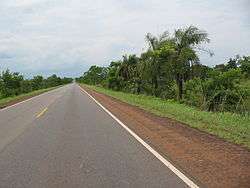 The BR-153 (also known as Belém-Brasília Highway) is the main highway of the Tocantins state. A.^ The presented pronunciation is in the Brazilian Portuguese variant spoken in Tocantins (and most of Brazil). The European Portuguese pronunciation is [tukɐ̃ˈtĩʃ]. 1 2 3 4 "Tocantins" (in Portuguese). Brasília, Brazil: Instituto Brasileiro de Geografia e Estatstica. 2015. Retrieved 2015-06-14. 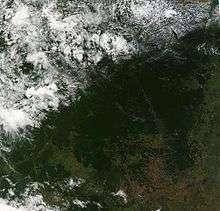 1 2 3 "Tocantins" (in Portuguese). Palmas, Tocantins, Brazil: Governo do Tocantins. 2015. Retrieved 2015-07-28. 1 2 3 "Bananal Island". Encyclopaedia Britannica. Encyclopaedia Britannica Inc. 2015. Retrieved 2015-07-28. 1 2 3 "Tocantins". Encyclopaedia Britannica. Encyclopaedia Britannica Inc. 2015. Retrieved 2015-07-28. ↑ "História" (in Portuguese). Palmas, Tocantins, Brazil: Governo do Tocantins. 2015. Retrieved 2015-07-28. ↑ Síntese de Indicadores Sociais 2007 (PDF) (in Portuguese). Tocantins, Brazil: IBGE. 2007. ISBN 85-240-3919-1. Retrieved 2007-07-18. Wikivoyage has a travel guide for Tocantins.